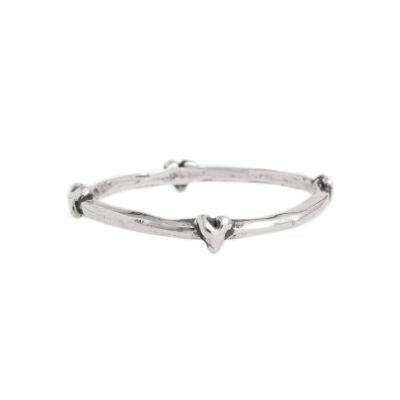 "Stackable Rings, Loverly Band in silver"
Put a little love in your life with our silver stackable Loverly Band. The simple stack ring holds four organic hearts equally spaced. Love these little heart rings! I bought two to stack with name rings, so I have five rings stacked. I have very petite hands and was worried about the bulkiness of five rings. These little rings are not bulky and don't take away from the other rings! They are perfect and I couldn't be more happy with these rings!! !